The seizure by the Islamic Front, a band of Islamist fighters who have broken with the moderate U.S.-backed opposition but are not affiliated with al-Qaeda, illustrates the increased fracturing of the opposition and the growing influence of Islamist forces on the ground in Syria. And it's presenting the United States with a tough decision on whether to work more closely with them. "We know al Qaeda, extremist groups, terrorist groups are involved in this, so it's not a matter of an easy choice between the good guys and the bad guys here," Defense Secretary Chuck Hagel said Thursday. The Islamic Front, which announced its formation last month, is an alliance that includes tens of thousands of fighters from some of Syria's most powerful Islamist groups, including Ahrar al-Sham, Suqour al-Sham, the Islamic Army and the Tawhid Brigade. 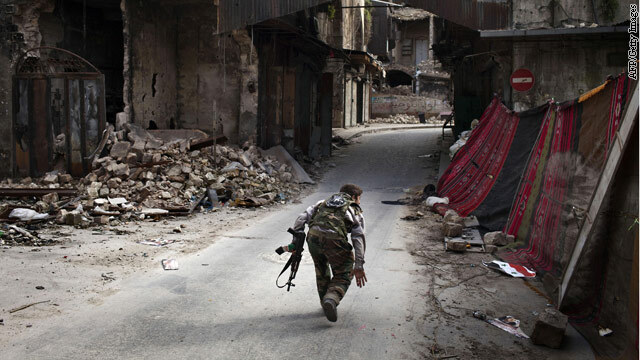 The groups control territory in key areas across Syria and have been fighting forces loyal to President Bashar al-Assad along the critical lines of Damascus and Aleppo, among other places. The front's formation has diminished the stature of the Western-backed Free Syrian Army and its leadership abroad, the Syrian National Coalition, as leaders inside the country have sought to distance themselves from a command structure criticized for failing to serve the opposition's needs on the ground. "The situation inside Syria shifted because Syrians feel they are on their own," says Andrew Tabler, a senior fellow and Syria expert at the Washington Institute for Near East policy. Noting that Iran is increasing its supply of fighters to support Assad's forces, he said, "the whole country is moving to the extreme." A month before a peace conference aimed at creating a post-Assad government, senior Obama administration officials acknowledge with rare candor they are struggling to assess what this development means for the future of its aid and, more importantly, its broader efforts to find a political solution to the conflict. "We know it's a big mess, but we are trying to understand what kind of mess it is," a senior administration official said. The open warfare between the moderate opposition and Islamist forces comes amid preparations for January 22 peace talks in the lakeside Swiss town of Montreaux. It was scheduled to take place in Geneva but was moved because most Geneva hotel rooms were booked for a luxury watch exhibition. The lofty goals of the conference are to end the civil war and identify Syrians who could serve in a transitional government to run the country if Assad leaves power. Discussions in Washington are about whether Idriss and the Supreme Military Council should be replaced by a new military structure to include some Islamist fighters. Officials said Idriss was in Turkey, where he has a residence, when his warehouses and his own headquarters in Northern Syria were seized. After going to Qatar, which has provided both money and weapons to the rebels, he is believed to be back in Turkey. Idriss said he did leave Syria but is working at his office on the Turkish border and has not left his job. In an interview with CNN's Hala Gorani, Idriss admitted that he doesn't fully trust the Islamists but that an agreement must be reached to control the fighting and form a single command. "The situation in the north of Syria now is very complicated and very dangerous because there are some problems between some groups, and I think we will try and we should try everything now to find a solution for this problem," he said. A temporary halt in nonlethal aid makes sense until the situation is brought under control, Idriss said. "It is very difficult now to pass the support to the right hands. And that's why I can understand the, let me say, freezing the support for a period of time," he said. Still this week's events could prove critical in shaping how the United States deals with the Syrian opposition, U.S. officials said. "It's a game changer," one senior official said. "None of us know where Idriss himself will end up. Our job now is to sew up what happened with what the reorganization of the SMC is going to be. But it's a much bigger question of what will the armed groups do in terms of their support for negotiations." The question U.S. officials are asking themselves now is whether Washington can work with some Islamist groups, which another senior administration official said "vary on a scale of bad guys." "It's a pivotal point," the senior official acknowledged. "We need to figure out, what extremists do we deal with? Can we work with the Islamic Front? We have talked to some groups before, but now our success in Syria may be determined on if we can we figure out how to work with them." At a meeting in Istanbul last month with several Islamist groups, U.S. Ambassador to Syria Robert Ford laid out one U.S. redline for doing business: no affiliation with al Qaeda. Although the groups have told the United States they are not aligned with al Qaeda, the allegiances of the various groups are unclear. Ford is back in Turkey this week to encourage Islamist groups to support next months' peace talks. "This is a really, really hard sell politically to these guys," said Frederick C. Hof, a senior fellow at the Atlantic Council who recently left the State Department where he worked on plans for a political transition in Syria. "A lot of water is under the dam. A lot of blood has been spilled. To think a collection of Islamists supporting a transitional government which includes forces who are aligned with Assad like the Alawite - I'm not sure how realistic that is." Even as preparations for the peace conference are being made, the White House is lowering expectations for the definition of success. Speaking at a conference in Washington on Wednesday, Deputy National Security Adviser Anthony Blinken said the fear that Syria could descend into further extremism suggests a possible "convergence of interests" among world powers to prevent it. The Syria Conference, he said, would be a "test" of whether world powers would band together to back a political solution to the conflict. But Hof said the disarray among the opposition makes the prospects for progress at the conference unlikely. "It gets to the question why you would go for a conference like this unless you have a feasible strategy in place," he said. Pointing to Blinken's comments, he added, "at least they have their expectations under control. Some in the Obama administration question whether the decision not to arm the moderate rebels earlier has led to the increased influence of extremist groups. "There are questions as to whether we wouldn't be here if we didn't take more aggressive steps, " a senior administration official said. Whether it is too late to change the battlefield, officials say, the same challenges to more robust support remains. "What can we legally do; what is the cost? What do the American people think," the official said. "The situation has changed but we still have the same challenges. And these challenges are compounded by new added level of complexity as the opposition is not just battling Assad, but each other. Even if we had the resources, there is no black or white." CNN's Hala Gorani, and Ana Bickford contributed to this report. SYRIA HAS A TERRORIST PROBLEM. How many brown people do we have to kill to make the CONs feel safe? Would those who would like to rule the world, kindly pay for their last fiasco first. Isn't it probable that the US strategy in Syria the last few years has created , and supported the Islamists? Blame John McCain for being so helpful. Well put, jay. This John McCain is nothing but a national disgrace to put it mildly! Oh here we go, blame anyone one but your inept leader. The whole world is watching how weak we have become, and the world knows Bammy lost all his credibility. Exactly what makes you think I like that killer Obama, Peppy? Just because I said that John McCain disgraced this country by representing it, that doesn't mean that I have any use for Obama! Goog little bamster, blame, blame, blame. I agree McCain is rubbish. However the overall chaos stemming from the admin instigated 'ArabSpring' is on Bammy. This is his 'smart diplomacy' in action. Bammy decided to escalate Afghanistan. Bammy used the painfully slow Bush exit plan in Iraq. Bammy continues to keep Gitmo open. If not for Putin, Bammy would have US troops in the Syrian wasteland. You are 100% correct. The percentage of the Free Syrian Army pales in comparison to the Islamist insurgents who are really no better than Assad. We don't HAVE to help anyone. If things look bleak for Asad but the choice is to help only fanatics then, Don't Help Anyone!! Standby because the devil we know is better than the devil we don't. We should have learned that in Iraq. Good thought, but since the US has been funding the Islamist it is a little too late. The US leadership is only upset the press is not continuing to hide their partners crimes. Why the USA wants out Assad? Difficult to understand? Because Islamist Turkey, a member of NATO (kick them the hell out of NATO), is providing false information to our Government and to our Military. It is plain simple. Islamist president E-DOG-rgan of the Islamist republic of Turkey is promoting the Turkish interests in the area. Turks have their own plan for the area. Just to slaughter the Kurds and annex parts of Syria. It is plain and simple. Simple to understand. Us wants Assad OUT because ISRAEL wants him OUT, and also because IRAN wants him IN. Period. look at that picture!!! Thanks to muslim terrorists, Syria is becoming a perfect location for horror movies shooting. It appears that you too have been stricken with that horrific disease they now call "affluenza", Phunnie boy. I feel sorry for you. This is what turns people into hateful right-wing fanatics. At least, Ethan Couch isn't the only one to have contracted this disease as proven by your hateful posts here!!! Hey dumbo your a very good bammy boy, blame everyone else. Congrats to the pres for winning the BIGGEST LIE OF THE YEAR AWARD. He can put next to his peace prizzzze !!!!! This is not good at all. It really isn't! That's all I can say! How about we dont support any extremists?! that sure sounds like a swell plan! I'm beginning to wonder if there ARE any non-extremists in that part of the world. Sigh. I find it shameful and deplorable that the USA is so hell bent on removing Assad for some reason I can't figure out, that the military is actually going to possibly go in and form some alliance with a bunch of radical islamic fighters. They know these guys are all bad guys and still they are playing the game of military interference when we really don't need to be there. These guys are all crazy. OUr miitary and the Islamic front guys. All of them. More than likely a majority were probably secretly trained by our people anyway and armed by us on the sly. The sudden formation of this group seems a little too quickly organized for it to have not had the CIA invovled somehow. We know who these guys are, and pretendng otherwise is just a bunch of b.s. Why the USA cares so much about taking our Assad is something I would like explained. Simply put Hank, is the fact that the right-wing thugs in Washington want to take over Syria and will use anyone at their disposal, even the Muslim Extremists to do so. Once their aim is achieved, they plan to dispose of these people since they will be no longer needed!!! But Bamman said they were on the run, congrats to bammy for winning BIGGEST LIE OF THE YEAR . I'm becoming discouraged. Maybe harsh dictatorships are the only thing that will get that part of the world under some control. Its a shattered mess. Maybe semi-democracies are just not in their capability set. This is very discouraging. since the 30s we have balanced our and in most cases the needs of the world interests by supporting the strongest dictators…i.e…the best of the worst perhaps. now we have obama doctrine, from a man who grew up in indonesia with a radical anti-colonist american hating mother….so connect the dots. The result, a horrible disjointed mess. This has got me really scare out of my wits! We simply can't have any of these damn Islamists take over the noble SFA, we just simply can't! If we're going to take over Syria, we need to boot these extremists out and not let them take any part in our glorious victory! oh please. FSA has always been muslim. this isn't a revolution. it's a muslim invasion of syria.